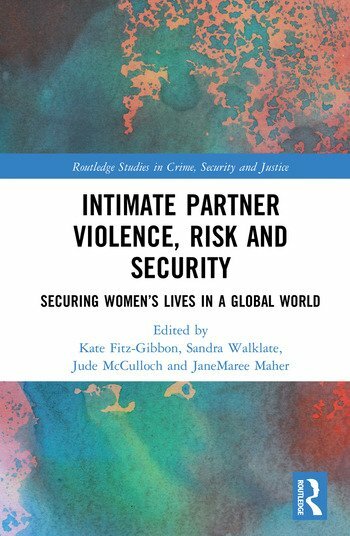 This edited collection addresses intimate partner violence, risk and security as global issues. Although intimate partner violence, risk and security are intimately connected they are rarely considered in tandem in the context of global security. Yet, intimate partner violence causes widespread physical, sexual and/or psychological harm. It is the most common type of violence against women internationally and is estimated to affect 30 per cent of women worldwide. Intimate partner violence has received significant attention in recent years, animating political debate, policy and law reform as well as scholarly attention. In bringing together a range of international experts, this edited collection challenges status quo understandings of risk and questions how we can reposition the risk of IPV, and particularly the risk of IPH, as a critical site of global and national security. It brings together contributions from a range of disciplines and international jurisdictions, including from Australia and New Zealand, United Kingdom, Europe, United States, North America, Brazil and South Africa. The contributions here urge us to think about perpetrators in more nuanced and sophisticated ways with chapters pointing to the structural and social factors that facilitate and sustain violence against women and IPV. Contributors point out that states not only exacerbate the structural conditions producing the risks of violence, but directly coerce and control women as both citizens and non-citizens. States too should be understood as collaborators and facilitators of intimate partner violence. Effective action against intimate partner violence requires sustained responses at the global, state and local levels to end gender inequality. Critical to this end are environmental issues, poverty and the divisions, often along ‘race’ and ethnic lines, underpinning other dimensions of social and economic inequality. Kate Fitz-Gibbon is a Senior Lecturer in Criminology in the School of Social Sciences at Monash University and an Honorary Research Fellow in the School of Law and Social Justice at the University of Liverpool. Sandra Walklate is Eleanor Rathbone Chair of Sociology at the University of Liverpool, conjoint Chair of Criminology, Monash University and Editor in Chief of the British Journal of Criminology. Jude McCulloch is Professor of Criminology in the School of Political and Social Inquiry, Monash University. JaneMaree Maher is Professor in the Centre for Women's Studies and Gender Research, Sociology in the School of Social Sciences at Monash University. All editors are members of the Monash Gender and Family Violence Research Program.